It's only natural that some types of insect pests will attack plants in your garden. But not every insect in a garden is an enemy. To control insects, you need to know what kind of insect you are dealing with, what plants it favors, and what time of year to expect it. 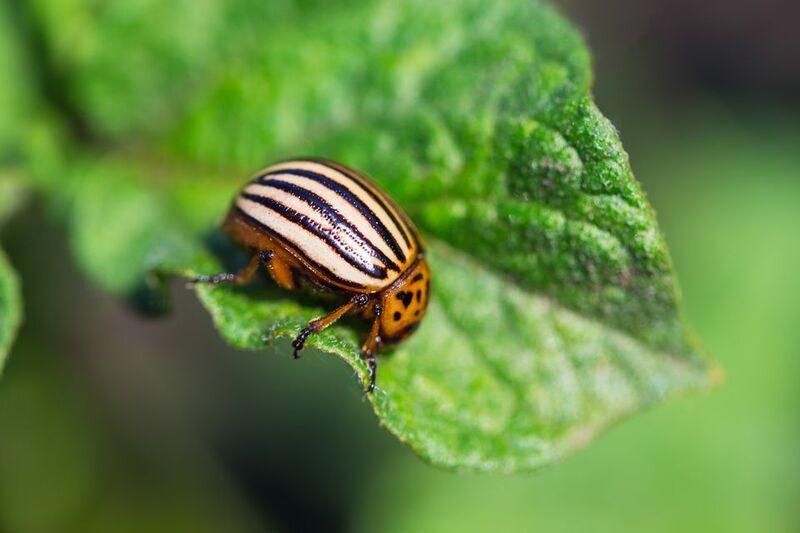 The first line of defense against garden insect pests is identification. For help with this, there are several online sites that provide photos of the most common garden insect pests. Most also provide additional information about specific insects' habits as well as cultural, natural, and chemical means for controlling them. The fact sheets provided by Cooperative Extension Services deal with the latest research on controlling pests. In recent years, Cooperative Extension has put greater emphasis on cultural and natural remedies, and they provide gardeners with insights into avoiding future infestations of garden insect pests. CSU/Denver County Cooperative Extension: Insects and PestsThe insect section includes non-pests, such as honeybees. Some of the fact sheets have insects in their various stages of development and offer cultural, natural, and chemical control methods. There is also a nice section on identifying and treating plant disease. Cornell Cooperative Extension: Entomology Insect Diagnostic Lab Fact SheetsIf you'd like to dig deeper or see what the most current research says, this is your site. There's a lot of great information here, but it's not the place to go for a quick answer or a photo id. Ohio State University Extension: Insects and PestsThis is an all-inclusive site with fact sheets on structural pests and household insects as well as the critters in our gardens. It's not big on pictures, and you'll need to know what pest you're looking for, but Ohio State has wonderfully thorough and easy-to-follow fact sheets. Penn State: Home and Garden Pest Problem SolverAn all-inclusive site featuring lists of insect fact sheets. The site includes good photos, succinct information and advice, and links to other useful garden pest fact sheets. Texas A&M AgriLife Extension: Insects in the City: Photos are grouped by beneficial, chewing, sucking, and soil insects. Just click on the photo and you'll get enough information to know what's happening to your veggies (and why) and what to do about it. You can also find the fact sheets listed by specific problems. Commercial websites may primarily exist to sell products or services, but they're also good sources of information on pests and specific products for pest control. Down Garden Services: Garden CreaturesThis page is provided by a landscaping firm in Down County, Ireland. it's set up with photo sections of "Friends," "Bad Habits," and "Enemies." Click on the photos for more information and suggestions for controls. Nature's Control Garden Pest IDA commercial site selling natural pest control as well as beneficials. They have great pictures and info on symptoms to watch for. The recommended solutions typically involve beneficial insects sold on the site. True to its name, this visual guide is easy to use and features numerous photos common insects and the damage they cause to their target vegetables.